Struggling to find the right study habits? Want to know the tips and tricks to succeed in your HSC? Anjali shares her secrets to managing time so you can ace your HSC. In this article, Matrix graduate, and Girraween Alumnus, Anjali, discusses her HSC experience, and reveals how she managed time to score a 99.40 ATAR. My best subject was Maths! I worked on a vast range of past papers, especially focusing on the harder last questions. 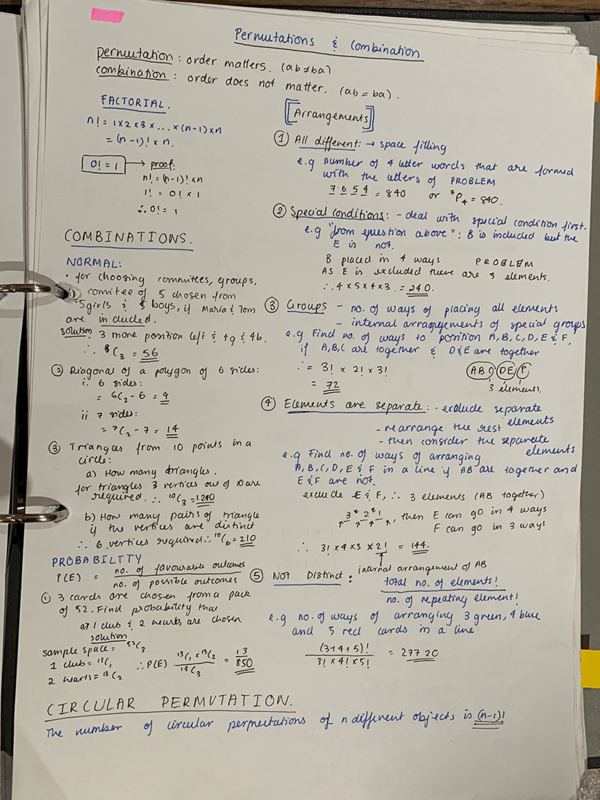 I completed a variety of past papers to expose myself to a variety of challenges: my school’s HSC Trial, other school’s Trial papers, and past HSC papers. To be sure, I thoroughly answered HSC past paper questions and even did some of them twice! My revision technique for Ancient wasn’t as strong as my other subjects. Because it is such a content heavy subject, I should have started revising earlier. Also, adopting different study methods, like flashcards or flowcharts could have further solidified the information I needed in exams. The HSC year was definitely the most memorable year of my high school life; I’ll have lifelong memories of it. However, with HSC stress looming around it was difficult to remain balanced. This is why it is so important to stay on top of it all. Step 1: Confide with a friend! During my HSC, I found talking extremely helpful. Whether it is about feelings, or new study techniques, it is important to have someone who you could talk to. They can be from home, school or even your work. I was able to stay calm and stay focused. My friend and I kept track of each other throughout the HSC year. We asked each other of our progress, discussed our assessment errors, and exchanged ideas for better study habits. This was a significant part of my stress management. It meant that nothing was bottled up for long and I could refocus on my goals without burning out. Engage yourself in your normal extracurricular activities! I continued taking dance lessons right up to the month before the HSC. Dance helped me momentarily escape the workload pressure and relieve stress. Even though it seemed like I was wasting time, I actually felt more focused and energised after dance. It was like charging myself to 100% battery as opposed to continuously working at 50% battery. So, it really paid off! Another key to HSC success is effective time management. 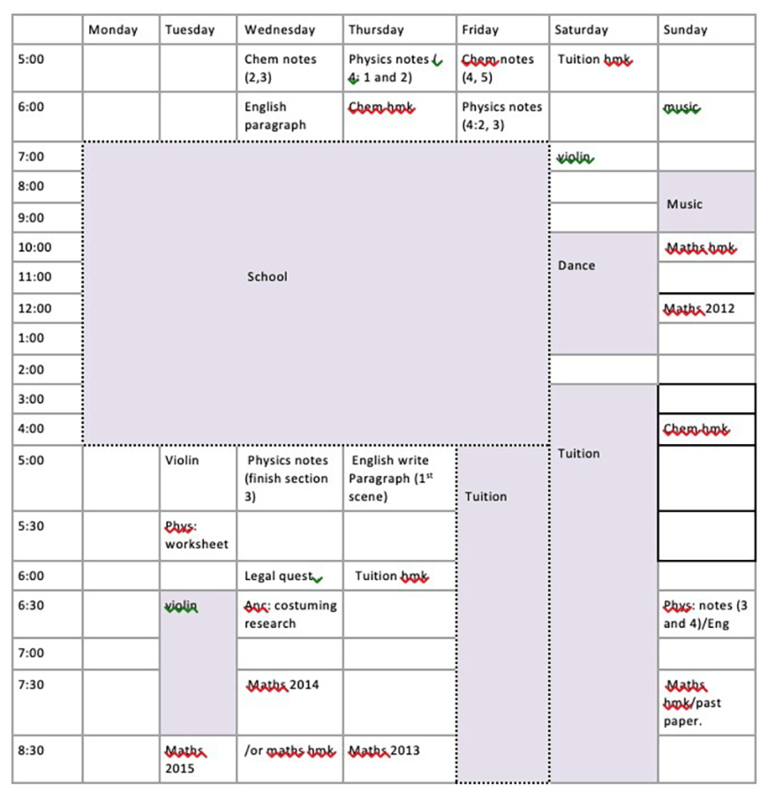 I started using a timetable in the beginning of Year 11. This perfected my planning skills and cultivated discipline. Both of which were essential for my HSC. My first few plans were quite unsuccessful. I couldn’t stick to them. I overestimated my ability to complete tasks. My timetables were too strict. They weren’t flexible to my ever-increasing amount of work. So, I had to come up with a new method! As you can see this was highly unrealistic! I was glad that I began managing time early on. This meant that I could test and see which plan worked best for me. I created both long and short term goals! On my wall, I stuck a monthly calendar and jotted down all my exam dates. I began marking the dates that my notes should be completed, and dates that I should start working on past papers. This was a great way to avoid last minute studying. It also meant that I was well prepared. 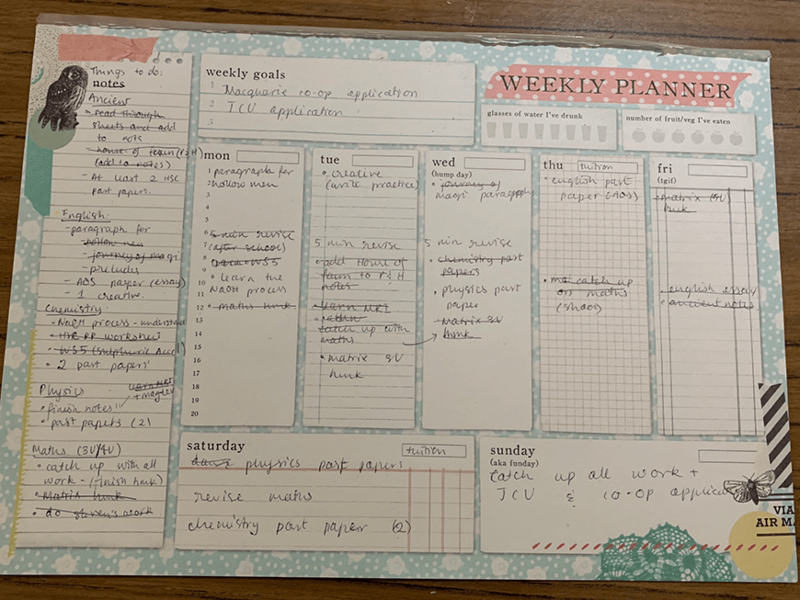 I also kept a weekly planner. Every Sunday night, I would make a list of all the tasks that need to be finished and put them under their subject headings. Then, I would plan out daily tasks for the whole week. This meant that I could easily add tasks if they came up during the week. It was important to prioritise tasks and understand that it is okay if you don’t complete every single one. During the holidays, I wouldn’t stress out as much. I had the time to do the smaller tasks, like reading the next chapter or starting my notes. Also, I did the Matrix Holiday Course for Chemistry. This really helped me because I saved time during the term for revision and more practice. Going over the content numerous times ensured that I better understand concepts and remember it. For me the hardest part of the HSC was TIME! I struggled to finish homework, write notes, revise and then practice for each subject. Finding the most effective strategies for study and time management was a skill I had to perfect. The HSC has almost an infinite amount of resources. It ranges from textbooks to online notes to the sum of past papers available on the Matrix One Drive for each subject. Make sure your sources are of quality and contains valid information. There is an easy way for you to make this judgement. Ensure that the information covers the marking criteria for any possible question given under that outcome. However, if you aren’t satisfied with the information or it doesn’t make sense… look for other sources! This ensures that you have a reliable and valid response. Writing was my best method of revision… but this took up a lot of time. Knowing this, I always gave myself plenty of time to quickly write up my summaries. This way I have enough time to work on past papers too! Again, the best way to avoid cramming, is to set up a timeline. Highlight the important tasks that need to be finished, then order it according to priority. 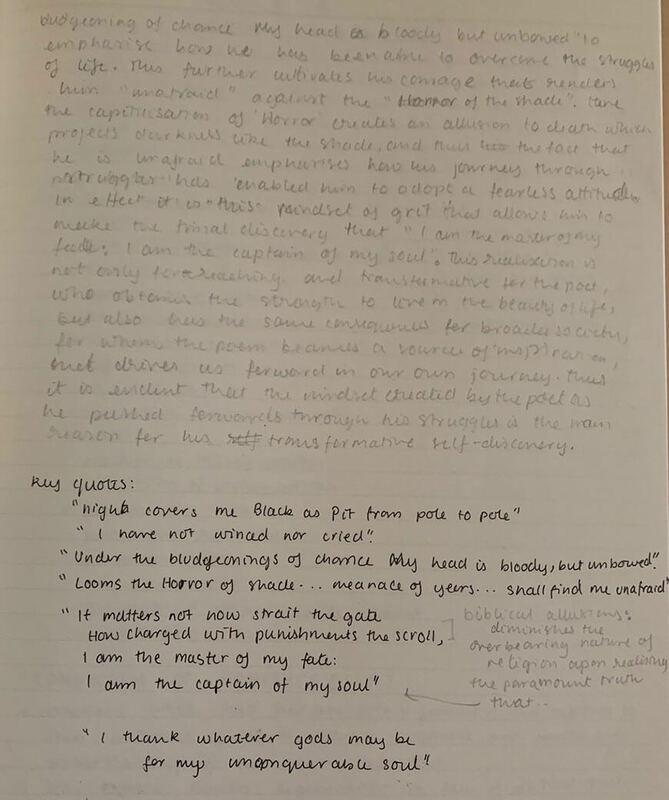 For English I used my class notes to write 1 or 2 practice essays for a broad question. I would write it out at least thrice, to memorise the key quotes, themes and concepts. 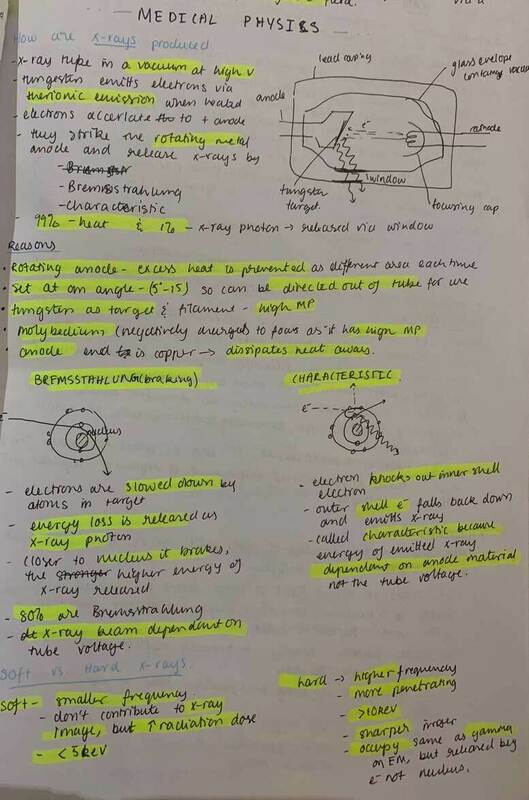 By using highlighters and colours, it emphasised my key points. This helped me save time that would otherwise be wasted on merely reading through notes. This stops you from wasting time! For me, I found that there are certain periods in the day where I study most effectively. If I tried to study non-stop for the whole day, I tend to be slower and quickly lost concentration. As you go through high school, you will realise your ‘peak hours’. This is the time where you are most efficient at working. Use this knowledge to your benefit. There were 2 periods that I worked best in; mornings before school and from 5pm until night time. Even during the school holidays, I woke up early and studied. Then, I took most of the day to relax, before working later that night. This way I could make the most out of my day. Start making notes early on, and set a deadline before the term so that you finish them at least 1-2 weeks before the exam! Having a planned schedule is key! However, as mentioned, try to make study timetables early on, so you are able to find what works best to make most out of your HSC. Doing past papers is also essential. This cannot be understated. 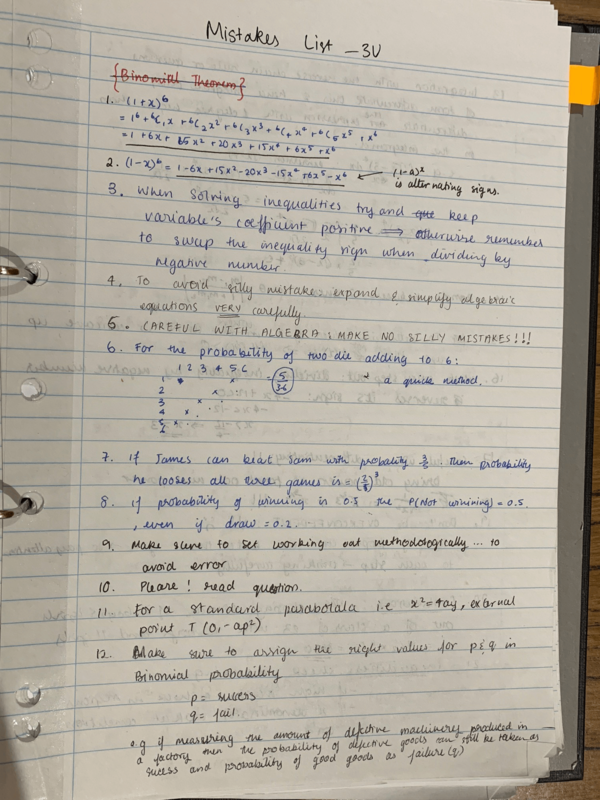 Perhaps one of my most useful study technique is creating mistakes lists. After completing each past paper, I looked back at the marking criteria. I had to be very critical of myself and wrote down all my errors as a list. Even very minor ones! I would highly recommend this technique as it helped me improve SO much for my subject. Especially Maths! Also for Maths, making summary sheets on loose paper for each topic was crucial! 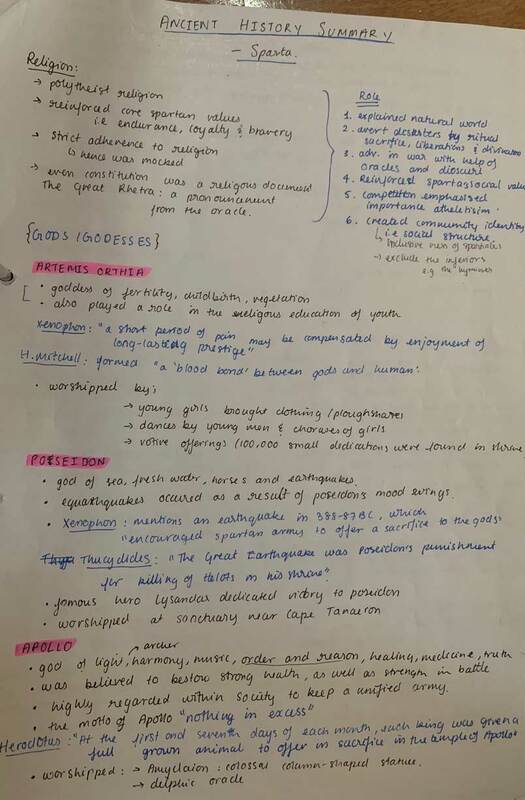 And during the term, I revised the content by going through my class books and writing notes. I used the Cornell note taking method.I wrote down all the key formulas and methods. The best way to perform your best is to try and stay calm, as hard as this sounds. Before an exam I wouldn’t talk too much with others. I just stayed with my closer friends so we didn’t feel as overwhelmed. I didn’t do the exams in linear order. I started with the easiest questions and worked my way towards the harder ones. This way I answered the ones that I was confident with, giving me more time to work on the harder ones. During the reading time I always tried to look through as many multiple choice questions as possible. I also answered them in my head, which saved me a lot of time. These exams always ask for long response answers. 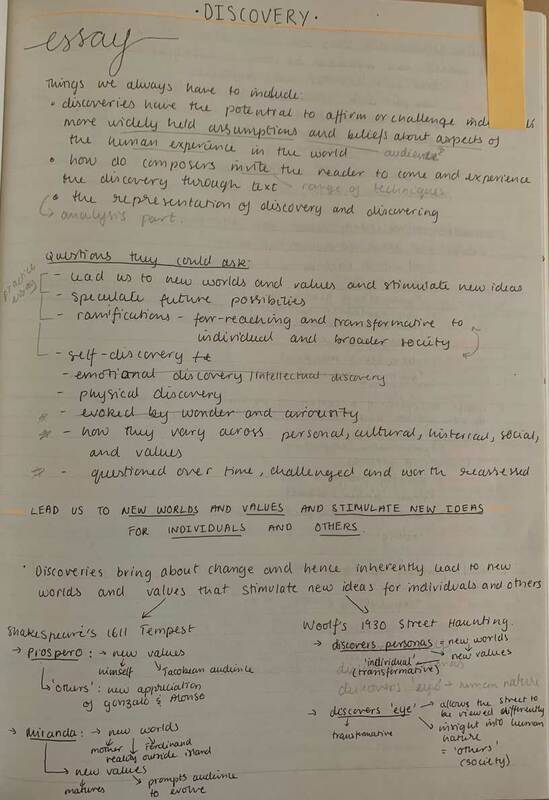 I always spend 2 minutes planning in the margins of my exam paper. This way, I wouldn’t loose track halfway through my exam. It was very crucial step because I saved a lot of time in the long run and my responses were much more clear. Year 12 was definitely my most memorable year. Honestly, I don’t have many regrets this year… but I do wish that I was more involved in school clubs and activities. Perhaps, I should have tried out for Prefects. Also, there is one thing I wished someone could have told me earlier. Focus less on notes and start past papers early. It is important to start working on past papers, at least 2 weeks before exams. Create a timeline or planner to organise work and set long term and short term goals. Once in a while, take a break by doing something you enjoy. Always try to be motivated by believing in yourself, and put your 100% in whatever you do. Study for long time periods (eg. 5+ hours). You will become ineffective and slower. Sacrifice your sleep. It’s not worth it! You won’t magically get better overnight. Put yourself down by comparing yourself to others. Even engaging with people who are too competitive will make you feel bad! Try to remain positive by focusing on yourself. Want to ace Chemistry like Anjali did? Get ahead of your peers like Anjali did with our Year 12 Chemistry Accelerated Holiday Course. With advanced completion of contents before it’s taught at school, you’ll be well-prepared for your next assessment. Learn more about the Chemistry Accelerated Holiday Course.